Chatfield Hollow's Main Wall is the crown jewel of all the rope climbing in and around Chatfield State Park. People have been climbing here at the Main Wall since the early 1970's and new routes are still going up here today. The Main Wall at Chatfield has a good diversity routes in a beautiful hardwood forest setting. Chatfield's metamorphic gneiss rock is distinctively different from Central CT's trap rock. It has exquisitely featured grey and gritty overhanging walls, roofs, aretes, cracks, and slabs with a good mixture of grades for all climbers from a beginner climbing 5.3 to an expert climbing 5.13s. You will be amazed by the holds you have to use on the routes here: finger cracks, jugs, huge slopers, underclings, edges, pockets, and razor blade crimps. 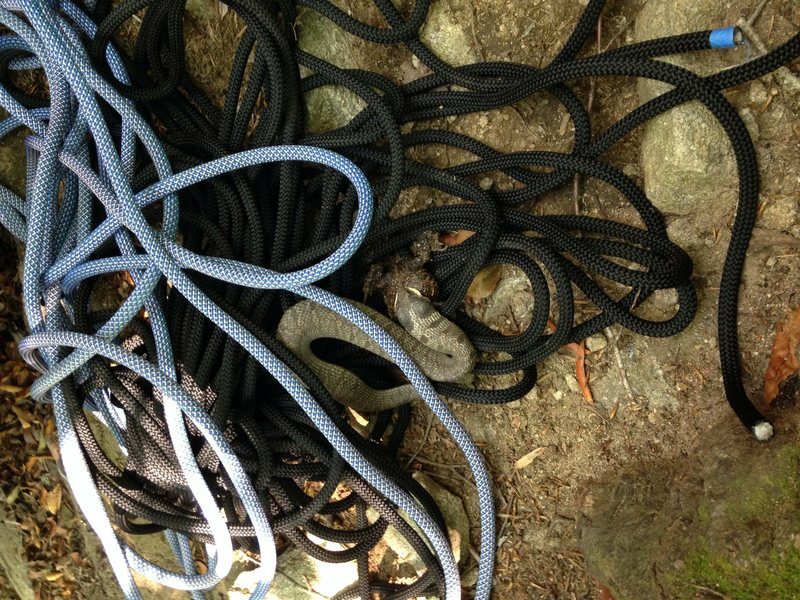 What is unique here, unlike many other Connecticut climbing areas, is that all styles of climbing live in harmony here. You can climb traditional gear protected routes, mixed routes, or pure sport climbs. Chatfield is a great place to climb a lot of routes in a day. It is compact and there are a lot of good routes within a close space. Some great moderates include the Trad Crack, Clark Bar Crack, Kyles Corner, and Super Slab. If you are looking to test yourself check out the Anarchist, Zeitgeist, Shape Shifter, Cold Vein, Its Own Spirit or the massive link-up of the Modern Collective. All these routes are different and they all pack a unique style of punch from bouldery to technical. Last but definitely not least, the traditionally protected crack routes here are some of the best in the state. Routes like Forearm Frenzy and Wallow In the Hollow will test your knowledge of gear placement and your climbing talents. These routes are classics and should not be missed if you are able to climb them. If new to the area and you are coming here for the first time bring a rope, some quick draws, and a standard rack with lots of small and medium cams. Be very carefully when you are walking on the delicate thin soils of the cliff top to set up your top ropes. Try as much as possible to tread lightly in this fragile environment. Walk on rock as much as possible. You will see some dead trees and battered vegetation and muddy trails from years of top-roping use/abuse. Walk on established trails or bare rock when you are setting up your anchors. Also please pick up any trash you might see on the way in or at the cliff. Let's keep Chatfield great for the next generation of climbers to come. From Route 9 (Main cliff area): take Exit 9. Follow Route 81 south to Route 80 at the traffic circle, watch for park entrance signs on the right, drive a little farther, park on the left walk up the road 150yds past a little roadcut then head into the woods just before the guardrail (faint trail) head in cliff is less than 100yds away on the North side of the road. From I-95: take Exit 63. Follow Route 81 north to Route 80 west, watch for park entrance signs on the right, drive a little farther, park on the left walk up the road 150yds past a little roadcut then head into the woods just before the guardrail (faint trail) head in cliff is less than 100yds away on North side of the road. There are a few climbs here that were previously done on top-rope, e.g. Shape Shifter, and the first lead (after bolting) is listed as an "FFA." An FFA has always referred to a climb that was done with aid and when freed it was referred to as an FFA. Top-roping is free climbing so shouldn't the sport lead be called something like "first lead" or "FA (lead)" or something like that? Not a big deal but the nomenclature may be confused for a previous aid climb. Calling top-roping aid climbing is not in keeping with the generally accepted definition of aid climbing. en.wikipedia.org/wiki/Aid_c… Under your definition you could call hang-doging on a rope while red pointing a route aid climbing. I would suspect that most of the bolted lines here were top-roped at one time or another and just not recorded anywhere. For example, I know that the Bloody Beetroots arete was top-roped back in the late 80s way before it was bolted. None by Ken that I know of but it wouldn't surprise me if Bob Clark, or Whitey MacLean and Marc Sprague didn't top-rope many of the routes here. Anyway, my point is, if you ask the vast majority of climbers what an FFA is they would tell you it is an aid climb that was freed not a top-rope climb that was later bolted and led. My 2 cents is I'd have, for example, Shape Shifter listed as FA (TR): John MacLean and Marc Sprague. FA (Lead): Greg Shyloski. Either way it isn't that important. Nobody is going to die by calling it a FFA. I had some help with my ropes today right by super slab.